Gormully & Jeffery was the second largest American bicycle manufacturer (after Pope), and G&J Tyres was one of the top 19th century tyre companies. Thomas Jeffery fought both Selden and Pope, and won. (Selden’s ‘road-locomotive’ patent included any use of an engine in a four-wheeled car; see further down the page). The Dunlop pneumatic tyre was very basic. 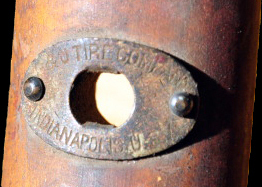 It was tubular in shape, secured to a bike rim by glue, with air pressure pressing it against the rim. Rims were wooden, and had a concave surface for receiving the tube. These tyres often came off the rims, and a more secure type of tyre was needed. 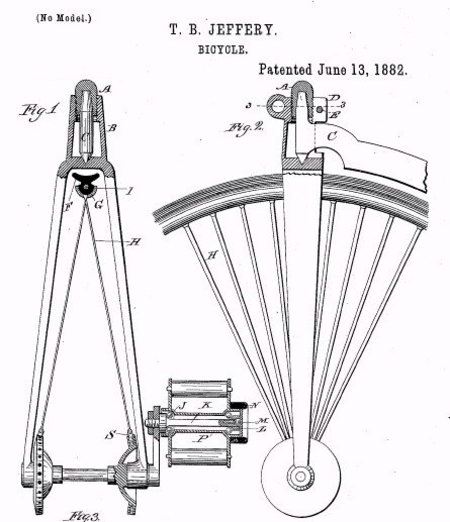 Thomas B. Jeffery had obtained a patent on the first clincher tyre in 1882 (see patent diagram above). He came up with an improved tyre that was held on by a wire that was embedded in the rubber of the tire, and the wire could be tightened onto the rim. Above and below is an example of a G&J clincher rim that has not been drilled for spokes. This report of proceedings between Erie Rubber Co and Dunlop gives you an idea of the type of arguments made during patent infringement litigation.